Hi everyone Robin here with my inspiration of the week for Dies R Us, your one stop shop for die cutting! With another wedding around the corner I decided to have a card ready to go instead of my usual scramble at the last minuet! However, I am getting much better and now have quite a few ready to go cards for any occasion. This card started with a subtle background paper layered onto my card base. Both the card base and the background paper corners were punched with my Crop-A-Dile Corner Chomper. Next I cut all the elements for the card. 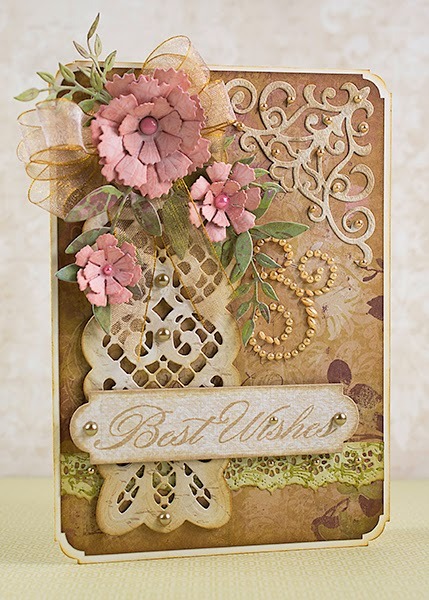 The dies I used are the beautiful Sue Wilson Designs Lattice Heart die, Spellbinders Corner Flourish, Cheery Lynn Anastasia Border, Cheery Lynn Sweet Williams, Spellbinders Back to Basics Tags, Penny Black Leaves and Cheery Lynn Olive Branches. 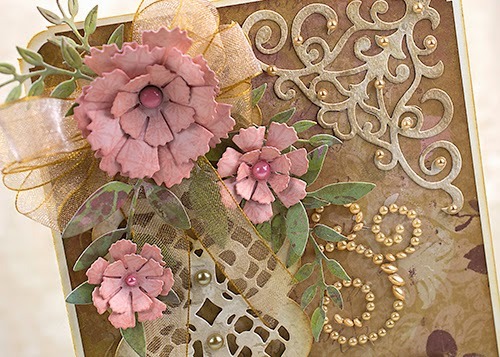 After the lattice, corner flourish, lace border and tag were added I made the flower bouquet and added it to my card with glue dots. I finished the card with a pearl flourish and individual pearls. Please be sure to add your name to the Dies R Us newsletter, not only will you informed about new products, but their sales are not to be missed! And don't miss out on our challenges; just go to the Dies R Us Challenge blog and read all the details! This is simply beautiful! Very elegant and perfect for a wedding. Now I have to add that Sweet William die to my want list! The flowers were the perfect touch! Just one word, gorgeous Robin! I'm speechless seeing this!! Sooo beautiful! Lucky necklaces can be given as being a durant for the bride-to-be, as being a report bodyweight for the couple of to make use of in their property, or maybe since cuff hyperlinks for the lick to wear around the wedding Engaged Bloggers.